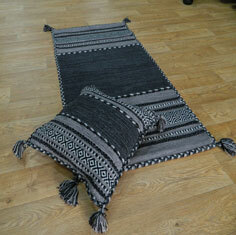 Inca Kelim rugs - Part of our handwoven Kelim range of exquisite rugs and runners. This range features stunning Inca patterns, hand-woven in 7 fashionable colours. The design is inspired by the Inca Empire which originated in south western America way back in the 14th - 15th century. Handmade from a mixture of cotton and chenille in India.